One of the most important and often under-rated aspects of any CAD program such as gCADPlus is the ability of the software to place appropriate dimensions into the drawing so that the design may be built by the construction team. Here is a small movie demonstrating the application of some some simple dimensions in a gCADPlus design. We then switch to a ‘proper’ landscape design for a remembrance garden and show how the designer can provide enough dimensional information for the construction team to build the job. When a new drawing is first started, gCADPlus creates a database specific to that drawing and builds on the database as entities are added. 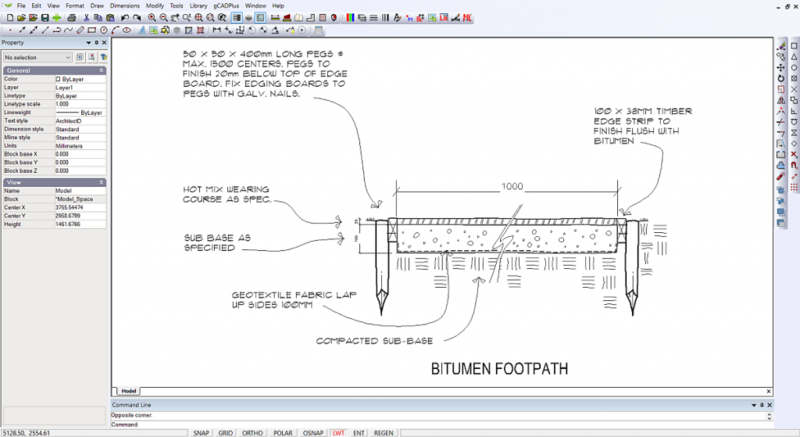 gCADPlus can access this database to obtain the dimensional data and add that to the drawing. Just as accuracy is important when creating a drawing, it is also important when adding dimensions. There is no point in drawing accurately and then adding incorrect dimensions. Care must be taken when applying dimensions, and osnaps should be used where appropriate. Tip: If you always draw full size (as we have emphasized in our learning materials) then you can (and should) let gCADPlus take its dimensions from the model that you have constructed. It does this automatically. On rare occasions it can be useful to override a dimension text value. Here we examine a design in which dimensions have been (correctly) taken directly from a design and compare it with a drawing in which the text override capability is used to change a dimension value.